Sunny Mann has masterminded a perfect life for herself and her family in a quiet Virginia town. Even her genius husband, Maxon, an astronaut on his way to the moon, has been trained to pass for normal. But when a fender bender sends her blonde wig flying, her secret is exposed. Not only is she bald, but she’s nothing like the Stepford wife she appears to be. As her façade begins to unravel, we discover the singular world of Sunny and Maxon, two outcasts who found unlikely love in one another. Theirs is a wondrous, strange relationship formed of dark secrets, long-forgotten murders and the urgent desire for connection. A week ago I would have said that there are no truly unique books anymore. That is until I read SHINE SHINE SHINE. What really make this book so unusual are the main characters. Sunny was always a bald nonconformist until she becomes pregnant with her son and then she starts wearing wigs and becomes a stepford wife. Maxon, Sunny’s husband, is a genius who is currently on his way to the moon with his beloved robots. He wasn’t able to perform the task of being the husband of a stepford wife as he isn’t comfortable relating to people without his formulas. 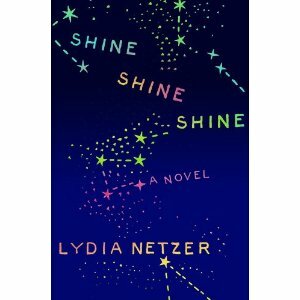 SHINE SHINE SHINE is a fresh take on love and what we has humans will do to ourselves to fit into society. I loved the author’s voice and how she makes me sit and think about things that I have always just taken for granted. And about the parts of myself that I have suppressed in order to fit into today’s world. I was impressed by this book as you can tell. And novel that remains with me after the reading and causes me to reexamine myself to determine what is real and what is part of the ‘wig’ that I put on to hide in plain sight is a great book. I do highly recommend this novel to anyone looking for a fresh take on life and love. I rate this book a 4.25. **I did receive this book at no charge thru NetGalley in exchange for an honest review.